Grevion, Sathya, Hellfire and 1 other person like this. American Tankers and Heavy Bombers join German Fighters for the Baltops 2017 exercise. Grevion and Hellfire like this. Dagger and Hellfire like this. By the looks of the collision, looks like it will be decommissioned . Hellfire and Gessler like this. Lockheed Martin Missiles and Fire Control Company (in cooperation with Boeing Phantom Works) has recently won an ~$19 million contract to develop, manufacture, test, and integrate a laser pod weapon for an F-15 (the article doesn't specify if it's a C or E model Eagle). The SHiELD (Self-protect High Energy Laser Demonstrator) program will be for characterizing the effects of transonic and supersonic flight on directed high energy weapons. It will also be the first stepping stone to generating future program requirements for a mass-produced airborne laser weapon system able to be carried by front line fighter and/or attack aircraft. Flying cars and laser weapons: the two technologies we were promised in our youth that would herald the arrival of the Future. The jury is still out on flying cars, but lasers have arrived. And when MFC’s Laser Pod Research and Development (LPRD, pronounced ‘leopard’) team is through, airborne direct energy weapons will be a lot closer to reality. MFC’s Fire Control Advanced Programs (FCAP) organization recently landed a contract worth over $19 million to research the effects of a high-energy laser in a transonic and supersonic environment. Under the contract, LPRD engineers are partnering with Boeing Phantom Works to develop and integrate a high-energy laser pod on a U.S. Air Force F-15 fighter. LPRD is part of an Air Force Research Laboratory (AFRL) Advanced Technology Demonstrator program called Self-protect High Energy Laser Demonstrator (SHiELD). SHiELD will inform requirements for future directed energy platforms intended for tactical aircraft survivability. The LPRD pod will connect and integrate the SHiELD beam control and laser beam generation systems with the aircraft’s sensors, electronics, and power and cooling systems. In addition to providing the power and cooling systems, MFC’s LPRD team will perform system integration, ensuring a high level of overall performance and safety. That will include early F-15 flight tests this year using an instrumented pod to perform aerodynamic studies. These tests will provide environmental data to ensure the hardware the team is developing will survive the rigors of supersonic flight. And somewhere in the 2023-25 time frame the SHiELD team will conduct a live-fire test against a missile target. Hellfire, Averageamerican and Gessler like this. The Model 2 is also based on a standard Glock 19, however it only receives one cartridge in the chamber and a 20 cartridge magazine is fixed parallel under the barrel. Another difference compared to the Model 1, this version is not equipped with a bridge arch but the final version should be equipped. As can be seen in the picture, flat the silhouette of the weapon is covered by a smartphone. Hellfire and Dagger like this. For the test, Raytheon coupled a variant of the Multi-Spectral Targeting System, an advanced, electro-optical, infrared sensor, with a laser. The MTS provided targeting information, situational awareness, and beam control. The system tracked and directed energy on a stationary target at a slant range of 1.4 kilometers. 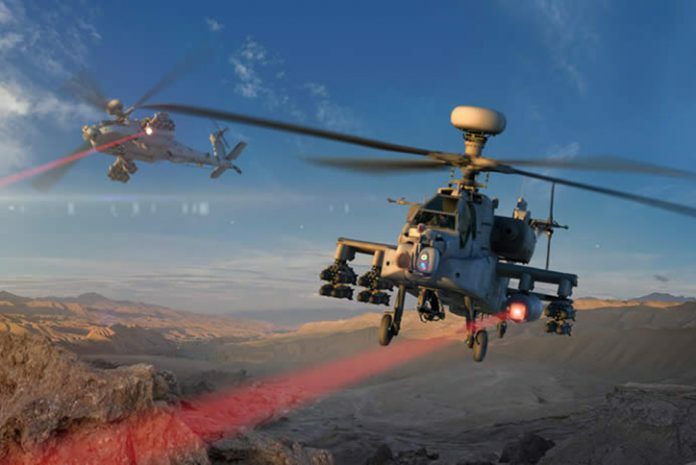 It was the first time a fully integrated laser system successfully shot a target from a rotary-wing aircraft over a wide variety of flight regimes, altitudes, and airspeeds, proving the feasibility of laser attack from Apache. The data collected from the test, including the impact of vibration, dust and rotor downwash, will help shape future high-energy laser systems. Modern, solid-state lasers are more useful for military applications as they become more powerful and compact. 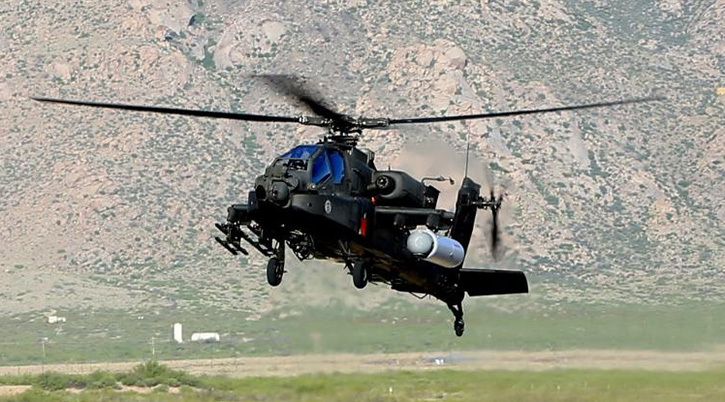 Podded versions such as the one tested on the Apache could be used on other helicopters in the future, enabling special operations forces and other operators to use kinetic effects with higher precision and lower risk of collateral damage. Congress marks Pentagon budget; Raytheon’s pitch for more missile interceptors; How Boeing will build a C-17 for India; and a bit more. Covering the House Armed Services Committee’s annual National Defense Authorization Act markup is a right of passage for defense reporters. Before video streaming allowed us to monitor it live from anywhere with an Internet connection, reporters had to camp out all day and night (and usually into the next morning) to listen to lawmakers debate amendments and cast votes on the bill. Some still do; Defense One’s Caroline Houck was among them. This year, the House finished Wednesday night just before the clock struck midnight. The Senate Armed Services Committee announced it finished marking up its version of the bill earlier in the day. (FYI, the Senate marks its bill in a closed session, without cameras or reporters or taxpayers allowed in). The only number that matters: $549 billion. That’s the spending cap for the base budget, which is law under the Budget Control Act of 2011. If the budget busts the caps, sequestration kicks in and an equal percentage of cuts are made across the accounts. We’ve debated ad nauseam the challenges of raising the budget and, if Congress increases it, where the additional funds would go. Now with committee-approved versions of the House and Senate National Defense Authorization Acts, we’re starting to get a better picture of what the 2018 budget will look like, but we still have a ways to go. Next up, Congress’ two appropriations committees will attack the budget. Hold on, folks. We’re still in the very early rounds, but to use an Air Force term, fight’s on. Here are some differences between the House and Senate versions of the NDAA: The committees both added F-35 Joint Strike Fighters, but at different levels. The Pentagon requested 70, the SASC approved 94 and the HASC 87. The House funded three Littoral Combat Ships, while the Senate made cuts (we don’t know how many yet, as full details of the bill have not been released). Lastly, the Senate funded 10 additional F/A-18 Super Hornets, for a total of 24 jets. The House added eight additional jets. 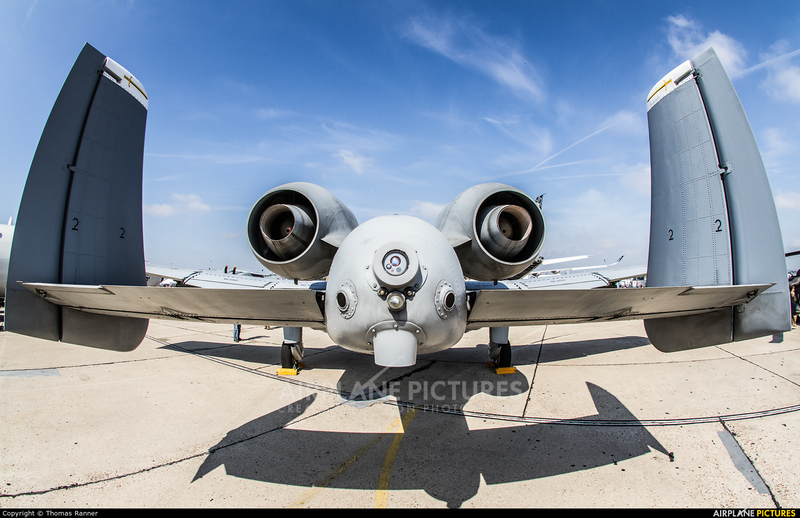 What the committees agreed on: Both committees put funding toward new wings for the A-10 attack jet. They each added six Navy P-8 maritime patrol planes. The Senate and House added two Air Force KC-46 tankers to the Trump administration’s request for a total of 17 aircraft. You’ve reached the Defense One Global Business Brief by Marcus Weisgerber. Back in D.C. where the weather is surprisingly much more pleasant than last week’s 100-degree heat in Paris. As always, send you tips, feedback and random thoughts to mweisgerber@defenseone.com or on Twitter@MarcusReports. Check out the Global Business Brief archivehere, and tell your friends to subscribe! President Donald Trump on Tuesday said he would nominate Ellen Lord, the CEO of Textron Systems, to serve as the undersecretary of acquisition technology and logistics. Remember, next year that position gets divided into two undersecretary roles. If confirmed, Lord would become undersecretary for acquisition and sustainment on Feb. 1, 2018. Lord has been a champion for the defense industry and is a member of the Center for a New American Security’s Task Force on Strategy, Technology and the Global Defense Industry. Here’s a video of her talking about the defense industrial base with Leonardo DRS CEO Bill Lynn and me at the 2014 Defense One Summit. With Lord likely heading to the Pentagon, pending Senate confirmation of course, Lisa Atherton has been named president & CEO of Textron Systems. She was previously the executive vice president of Bell Helicopter’s military business. The Pentagon grabbed headlines in late May when it used a massive missile interceptor to take down a mock ICBM. It was an important test at a key time — amid repeated threats from North Korea and as the U.S. expands the number of its Ground-Based Midcourse Defense interceptors, or GBIs, in Alaska and California to 44. Boeing is the lead contractor for the interceptor project, but Raytheon makes a critical component — the kill vehicle, a device that steers the interceptor into the missile. Last week at the Paris Air Show, I chatted with Mitch Stevison, vice president of air and missile systems at Raytheon Missile Systems, about the prospect of adding more interceptors. Raytheon, Stevison said, has the factory space and parts to build more kill vehicles. The Missile Defense Agency is working on a new kill vehicle called the RKV, or redesigned kill vehicle. Lockheed Martin and Boeing are competing against Raytheon for that project. Another busy year for missile defense. Then next year there will be another SM-3 test and a Ground-Based Midcourse Defense interceptor test. What else is Raytheon working on? This week, perfectly timed to India Prime Minister Narendra Modi’s visit to Washington, the State Department approved the sale of a single C-17 cargo plane to New Delhi. You might be saying to yourself: “How the heck is India going to buy a new C-17 when Boeing closed its Long Beach, California, production line in 2015?” I’ll admit that was my first thought as well. But then I remembered that the company built some extra planes, 10 to be exact, for anticipated orders. Turns out, this is the last unclaimed aircraft, a Boeing spokeswoman said. The plane has been in storage at a Boeing factory in San Antonio, Texas, where it does C-17 maintenance work. The military’s new F-35s and F-22 fighter jets are technologically leaps and bounds above the older jets they battle in stateside wargames. In fact, the Navy still uses F-5s, which were designed in the 1950s, to simulate bad guys. While the planes might be high performance, they don’t have the advanced electronics that say modern Russian and Chinese jets have. So how do you make these old planes seem like new? Give ‘em a tablet. San Diego-based Cubic touted its Bandit Board — a device that straps to a pilot’s knee — at the Paris Air Show last week. “The challenge is how do you make your adversary force representative of a [fourth or fifth-generation fighter jet] threat without having to recapitalize your entire adversary fleet,” Dave Buss, senior vice president and president of Cubic Global Defense, said in an interview. Here’s how the Bandit Board works. The tablet connects to a special missile-shaped pod on the plane’s wing. That pod connects the plane to the cloud and allows it to see all the planes in the mock battle. “Just by adding situational awareness of where everybody else is, it allows the adversary to be more threat representative because he’s got the same kind of awareness that an adversary fighter would have from his datalink capability,” Buss said. Cubic has been working on upgrades to the pod itself, allowing the old planes to simulate many other functions of a modern fighter jet. “[It’s a] very inexpensive way of giving situational awareness, sensor and weapon capability to an adversary and essentially taking a second- or third-generation aircraft and upgrading it to something that’s more threat representative,” Buss said. Leonardo DRS — the American arm of the Italian aerospace and defense firm formerly know and Finmeccanica — closed its acquisition of Daylight Solutions, a company that makes quantum cascade laser based products and technology. WASHINGTON: Despite reported differences, the House and Senate Armed Services Committees propose almost identical toplines for national security spending. In an apples to apples comparison, after correcting for discrepancies in what the two committees count, HASC’s total is $704 billion, SASC’s is $708. That’s a difference of just 0.6 percent, presenting a strong united front against Tea Party budget hawks and the Trump Administration, which proposed $668 billion. These figures include not only the Defense Department’s base budget but also Overseas Contingency Operations, mandatory spending, and spending at non-DoD agencies like the Energy Department. The committees confused the issue by counting differently. SASC’s official topline of $700 billion includes almost $8 billion of national security spending that’s in the jurisdiction of other committees, chiefly Intelligence, Homeland Security, and Foreign Relations; HASC’s $695.9 billion does not. HASC, for its part, counts $7.5 billion of mandatory spending; SASC cannot count an equivalent sum, because they’re still waiting an official CBO score — but it’s a safe assumption (which we made) that the figure will be nearly the same. The same apples-to-apples problem applies even to Defense Department spending. HASC says they’re authorizing $593 billion for the DoD base budget, plus $65 billion in war funds called Overseas Contingency Operations, plus $10 billion in “OCO for base” — i.e. base budget activities funded under OCO as a legislative sleight of hand — for a total of $668 billion. SASC says they’re authorizing $611 billion for the base and $60 billion for OCO, totaling $671 billion. The Senate isn’t trying the OCO-for-base trick: To the contrary, they moved $5 billion to shore up NATO allies against Russia, the European Deterrence Initiative, from the OCO fund for the base budget. If the committees had used funding categories consistently — if you were to move the Senate’s deterrence money back to OCO and the House’s OCO-for-base into the base — then the Overseas Contingency Operations figures would be identical and the base budgets only $3 billion apart (HASC $603, SASC $606). Overall, while the Senate side has not published their full bill, only a summary, the information we have so far suggests that SASC chairman John McCain and his HASC counterpart Mac Thornberry are closely aligned. On policy, the highest profile difference is probably the House plan for a Space Corps, split off as an independent service from the Air Force. On personnel, the Senate would add 7,000 troops across the services, while the House would add almost 20,000, an expensive difference as well as a steep challenge for recruiters. On procurement, the two committees have many significant but hardly earth-shaking differences. The Senate wants a few more F-35 and F/A-18 fighters — McCain is a former fighter pilot — while the House has more Littoral Combat Ships— McCain dislikes LCS, like many old-school Navy officers. But then they coincide exactly on details like how many P-8A Poseidon naval reconnaissance planes to add to the administration request (six) and how many Ship-to-Shore Connector hovercraft to add (five). So he fireworks this year won’t be between the House and Senate authorizers. They’ll be between the authorizers and everyone else on how to pay for all of this— which means, to start with, killing the Budget Control Act.